Muniesa made his La Liga debut with Barcelona as a 17-year-old and was an unused substitute for the Champions League final win over Manchester United in 2009. 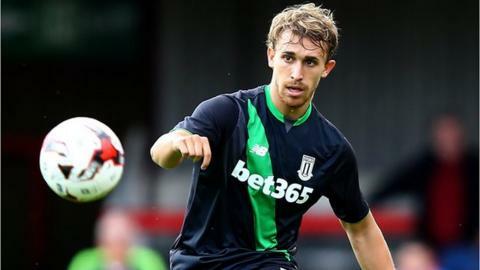 Stoke City defender Marc Muniesa has signed a new four-year contract with the Premier League club. The former Spain Under-21 captain joined the Potters on a free transfer from Barcelona in July 2013. The 23-year-old has made 39 appearances over the past two seasons and scored his first goals in Stoke's 2-0 win against Sunderland in the League Cup last September. Muniesa's new deal will keep him at the Britannia Stadium until at least 2019. Last season, a hamstring injury in February sidelined him for two months before he returned for the final three games of last season as Stoke finished ninth. "It's great news for us. If he continues to progress as he has since he came here, he's going to be a very good footballer," boss Mark Hughes told BBC Radio Stoke. "I see him as a left-sided centre-back and he does as well - that's his favourite position. "We know he has the flexibility to play left-back too, but that just demonstrates what a versatile player we have."